I have long envied people who stick to their morning rituals. Or maybe they rely on them. I find the world highly ephemeral. I try not to rely on anything I don’t feel compelled to rely upon. So I’ve watched over the years, now that people share, in the Instagram perfection of it all, their rituals, if not daily, then at least over time what appears to be a daily thing. The first action of the day might be making coffee. They grind, froth, stir, and ease into their day. Some get kitted up and cycle to their favorite spot where they meet others of similar ilk and collectively drink and eat a bite of something before whisking off on their daily ride. Lots of folks I know head quietly to their workshop of choice. Wood, pottery, metal–it matters not. They spend some time making things that they or others may cherish for years to come, a tribute before heading off to work. Sometimes it’s a wish, a hope, or prayer that they can spend more time doing the creative activity they love. My mornings have been defined by external factors for a long time. Garbage and recycling 3 times a week. Getting DaKid™ on the school bus. Sometimes commuting. But not much in the way of taking a few moments to greet the day. I have a pile of gifts that I’ve been making in my little wood shop for a while. Some of the folks have been waiting years for their gifts to be completed. Sad. So terribly sad. Last year and now this year have been banner years for completing projects. Bookcases, a dining room table, and now the gifts are all being finished. And while it’s a tiny fraction of what it used to be, I’m even working on some new music. I find new rituals establishing themselves. After taking care of the other stuff (garbage, School bus, etc.) 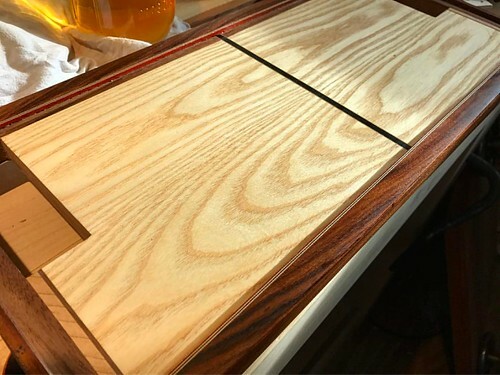 I make my way to the shop and spend a few minutes adding another coat of shellac to a board. Or some other not very risky task. Risk takes time. I need to be able to back away, think, come at it again. There’s little time for that in my morning. Shellac is a beautiful finish. A bit high maintenance for some, but beautiful. I use very thin coats and many of them. Each day another thin layer is applied. It’s probably dry in ten of fifteen minutes, but work beckons, and so I don’t make it back there until the end of the day. It is ritualistic. I go down there, flick on the lights, put one glove on like a drunken surgeon, uncap the canning jars, one with shellac, one with the cloth pad. A few swipes later, and I’m done for now. The jars are lidded, and the glove, turned inside out as I remove it, goes in the trash. More recently, as I began composing some new music, I started practicing again. I sit down, grab an instrument, turn on the metronome and lose myself in exercises for 15 or 20 minutes. Amazingly peaceful for me. A touchstone from an older aspect of my life and a meditation. And probably something I should every day for the rest of my life. It’s not “playing” or “performing”. It’s a simple discipline where I work toward increasing facility. Playing things that are hard for me now until they become smooth and easy. A new picking technique. A hard to play phrase. A difficult intervalic leap. A few concentrated minutes that stops time outside of my focus before the day is in full swing. A morning ritual.